The unique thing of Akbar Cafe is the charming of its huge spaces and also its long tunnels. There are also many interesting scenery of cave which you can not find in other places. If we come in the cave we will see the river that flow calmly, in that river we will see the various fishes, which the water comes from water fall in the centre of the cave. You may feed the fish by throwing down a little piece of bread. In other part of space, called "Mahahandhapa Sri Manganti", the visitors will be presented with traditional music like Gamelan, Siteran and any other traditional music. Sometimes, there is a solo pionist or guitarist, and the visitors can involve in singing a song. 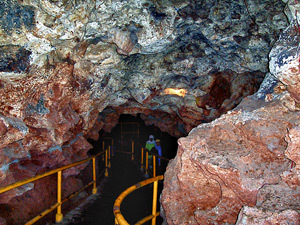 This cave has two sacred places called "Pasepen Kori Sinandi" and "Pasujudan Baitul Akbar". You have to put of your shoes when you are going to enter. It is forbiden for women who get menstruation. The area of the cave has been opened about five hundred in square meter only. The long tunnels that are forty or fifty kilometers has been closed to avoid any danger. Small cafeteria is available, too. The slow music will accompany while you're enjoying the food and drinks. The cave is located in the centre of the town. It is behind the traditional market "Pasar Baru". So you will not find any difficulties to get there. Come and see its beauty. * This miracles cave was well-known as a hidden place of Raden Mas Sahid, a generous robber who finally regretted and becomes the saints of Islam (Wali Songo), with his popular name "Sunan Kalijaga" in 17th century.